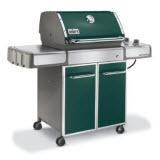 ﻿ Weber Gas Grills Web Site-Weber Gas Grill Won't Light? 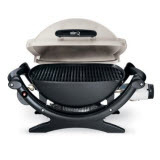 Weber Gas Grills Home | How to Care for Your Weber Gas Grill | Direct or Indirect Cooking | Weber Gas Grill Won't Heat?| Weber Gas Grill Won't Light? Weber Gas Grill Won't Light? My Weber gas grill won't light. What could be the reason? If you can light the Weber gas grill with a match you may have an ignition switch problem. Check your igniter switch. Is it making a clicking noise? If the igniter does not click, it is not aligned correctly with the gray rocker switch. To align it, remove the control panel (consult your owner's manual for instructions). Once the control panel is removed, check the position of the igniter. It should be tightly secured with the lock nut in the smaller hole of the keyhole frame. If the igniter has clips on the sides, rather than a lock nut, make sure it is completely “snapped" into place. If the igniter is aligned properly, make sure the control panel is not loose. There should be two fasteners holding the panel in place. Next, check to see if the Weber gas grill igniter wires are loose. The white and black wires should be secured at both ends. Then check the position of the metal tab protruding from the cookbox where the white wire attaches. This tab must be 45 degrees away from the cookbox to avoid a shorted circuit. 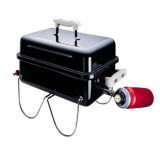 Finally, very humid or rainy weather can cause moisture to collect on the end of the probe and make the Weber gas grill igniter unable to spark. To remedy this condition, light the Weber gas grill grill with a match. The heat from the grill will warm the probe and should fix the problem. If you cannot light the Weber gas grill with a match you probably have a gas flow problem. Have you cleaned your burner tubes recently? It is very important that the portholes of the burner tubes are clear of any blockage. If the gas flow is restricted, the igniter will struggle to light. To clean your tubes, brush the portholes with a steel wire brush in an up and down motion. 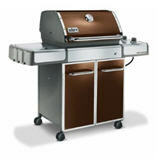 This cleaning should be part of your routine maintenance.
. Weber Gas Grill Wont Heat?
. Weber Gas Grill Wont Light?